A Palmetto Bluff Wedding is set in a centuries-old maritime forest in the South Carolina Lowcountry. Palmetto Bluff is a vast expanse of land and is bound by the May, Cooper, and New Rivers, and it is set amidst ancient forests and marshes that teem with life. The bluff is home to a community that celebrates a vibrant residential and recreational preserve. The area is home to a variety of wildlife, unspoiled rivers, salt marshes, and is full of wild natural beauty. This Palmetto Bluff Wedding was blessed by the soft South Carolina spring rain. 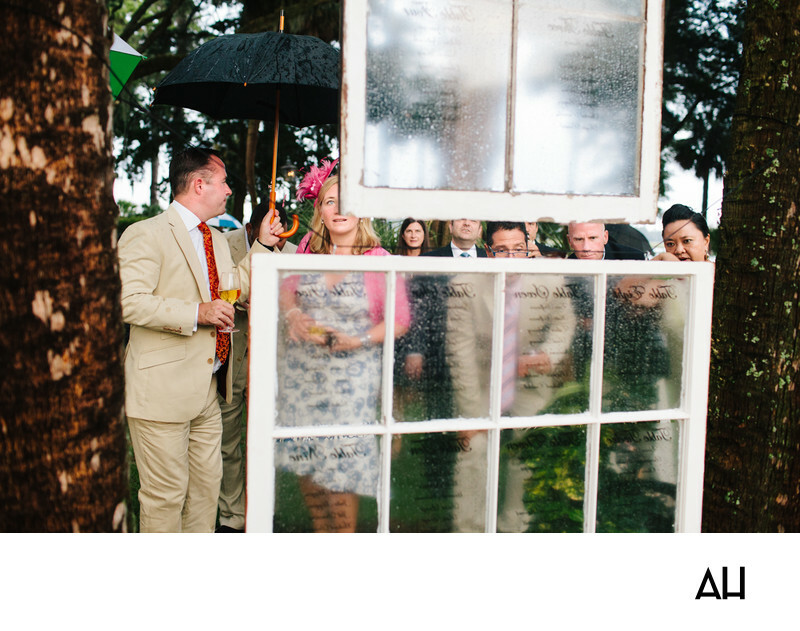 As seen in the image, some guests tried to stay dry under umbrellas as the rain dripped through the trees, while others simply embraced the moment and risked being wet. The rain has painted the trees a dark brown, speckled by the lime green of the moss that grows on them. The guests in the picture are inspecting the table seating arrangements to find out where they will be sitting during the reception and who they will be seated with. This information is laid out for the wedding attendees in a very unique and creative way. Windows are suspended in the air between two trees, with the table numbers and guests’ names printed in black in each box of the wooden pane. The window frames have a vintage look, white distressed wood, but the writing is done in elegant script. This meshing of two styles is symbolic of how the whole wedding felt, filled with old Southern charm and elegance.